Two dovetailed drawers fully extend, while a mirror back display illuminates your most valuable possessions in the Evendale Court Petite China Hutch. 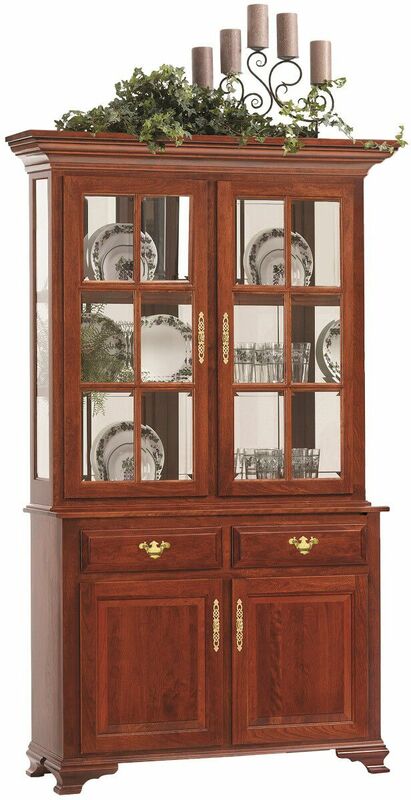 Shown in solid Cherry with a Christmas Cloves stain, this 2-door Queen Anne hutch is made-to-order. An elegant crown moulding is befitting our Evendale Court Petite China Hutch. Glass encases the entire upper display case and touch lighting adds an elegant glow. A traditional Queen Anne bracketed foot and brass hardware accompanies the smooth hardwood. Choose from our options menus the details our Amish craftsmen should include in your built to order Evendale Court Petite China Hutch. Countryside will deliver it to your home or place of business.